Las Vegas, NV • October 8, 2016 — Big Dog’s Brewing Company earned a bronze medal at the 2016 Great American Beer Festival (GABF) competition. Presented by the Brewers Association, GABF is the largest commercial beer competition in the world and recognizes the most outstanding beers produced in the United States. 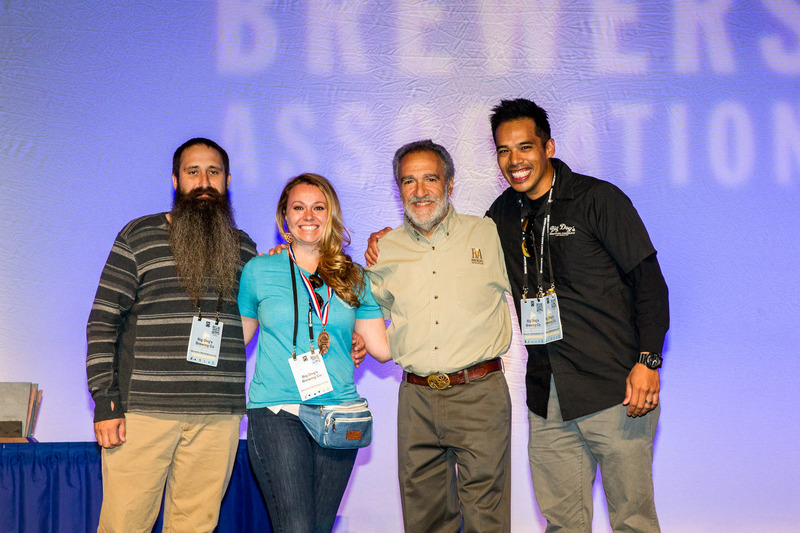 The top three winners in the competition’s 96 beer-style categories were announced October 8 at the Great American Beer Festival awards ceremony held at the Colorado Convention Center in Denver, Colorado. The brewing team of David Pascual, Amanada Koeller, and Sam McKinney accepted the honor on behalf of the company at the awards ceremony. This year’s Bronze medal is the company’s 10th GABF medal since the brewery’s founding in 1993. “It's always nice to continue the tradition of winning medals at Big Dog's. It just validates the brewery staff's hard work and commitment to the craft, especially when we are being judged by fellow brewers nationally and from around the world. Every year it gets harder and harder and with so many fantastic breweries and hundreds opening every year, it definitely keeps us on our toes,” said David Pascual, Head Brewer/Director of Brewing Operations at Big Dog’s Brewing Company. "We are all very blessed to have such a wonderful team and are very excited about winning a medal at this year's GABF. It’s a well-deserved tribute to the hard work and true passion for all of us here at Big Dog's Brewing Company and our supporters," added Kurt Wiesner, the company’s President. Big Dog’s Brewing Company was recognized in the Belgian-style Tripel category, which had 92 entries, for its Tripel Dog Dare, a classic Belgian-style beer brewed with all traditional ingredients. Belgian Tripels are known to be deceptively strong yet complex due to their enticing color and delicate flavor and aromas. Bright golden in color, the beer has both aromas and flavors of fruit (citrus and banana) and spice (clove-like). Tripel Dog Dare has a medium/high carbonation with a soft mouthfeel and finish. It is a great beer to pair with roasted turkey, seafood, and pesto dishes, to name a few. Big Dog’s Brewing Company is a 15-barrel batch brewpub and production facility located in Las Vegas, NV. Big Dog’s specializes in wide range of craft beer styles, including a year-round stable of fine ales, lagers, and specialty brews. Popular beers produced by the brewery include Dirty Dog IPA, Red Hydrant English-style Brown Ale, Las Vegas Craft Lager, and Peace, Love & Hoppiness Pale Ale.